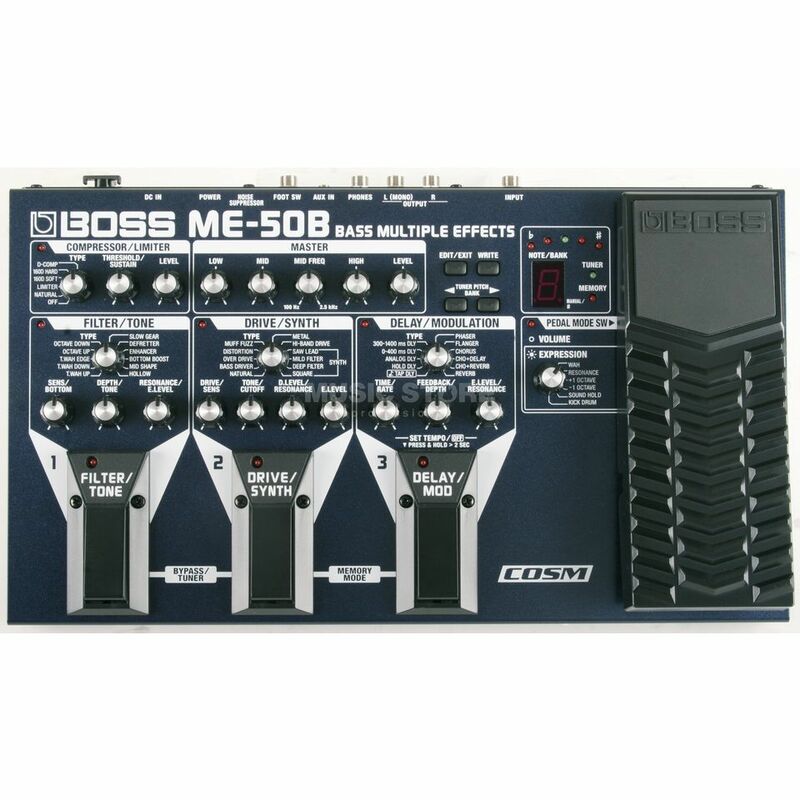 The Boss ME50B Bass Guitar Multi FX Pedal. Delivers world-class bass effects in a rugged floor unit with easy pedal-style control. The Boss ME50B is a bass player’s dream come true. It produces a professional sound on an easy-to-use pedal enabling control over everything with clearly marked knobs. Effects are divided into 6 sections (Compressor/Limiter, Master EQ, Filter/Tone, Drive/Synth, Delay/Modulation, and Expression Pedal), giving bassists a range of unique and powerful tones including fresh effects like Sound Hold, Octave Up, and Kick Drum all with easy knob-based control. This Boss ME50B has a ton of effects inside and you can get it to sound just right. It has an awesome workmanship and its pretty simples to use. For me, the weak spot here is the preamp (you cant modify much your sound and when theres no way to bring your amp, you cant rely in the ME50B to save you).However it may work just fine with a nice active bass, which already has a preamp inside it... Its a little high priced for what it delivers. bought this a few years ago as my first multi-effectspedal for bass. and its really good, i was just a beginner, not really knowing whats what. but i really love this pedal. bought it primarily to try out the distortion sounds for bass, but also wanted to know about other effects. A Boss multi-effects tradition, good sound and good build quality. The controls are simple and intuitive, even in a live situation. The price is adjusted to the overall quality. The only problem is the power supply is not included in the package.